How do ya like them apples? You wont find apple juice in most bars. Its an old joke among bartenders that a kid walks up to a bar and orders apple juice. I guess I’m a kid at heart, because one of my favorite lazy summertime drinks is simply unfiltered apple juice and bourbon. But it just seems to me that they go together. 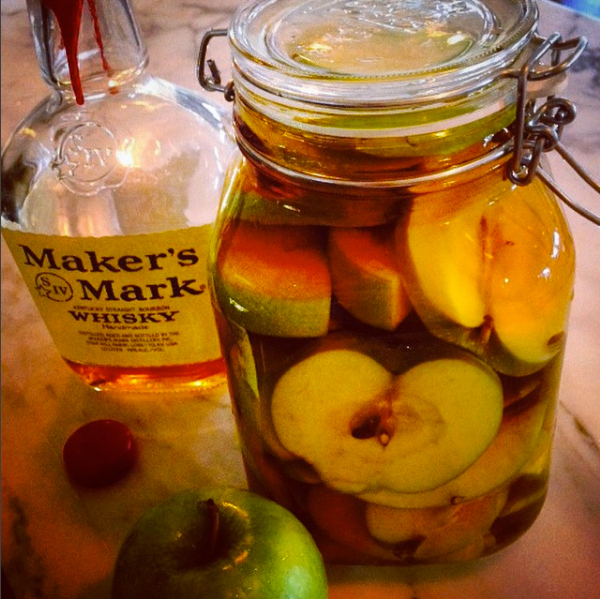 Admit it, you are already tasting it in your head, apples, bourbon, oak barrels; they just go together. My drink “Made in the Shade” is my apple muddled version of a Kentucky Maid. I also do an Apple Whisky Martini. I loathe the standard recipe for Apple Martinis, you know the one that uses the sour pucker, ew! I prefer using a muddled granny smith apple and yes, it takes some serious elbow grease to make those drinks but its worth it. But here we have the best way to get the sugar out of the apple into the whisky with no extra effort other than patience, the more patience the better, so you might want to rotate batches.